Ring in the new year with fun party favors. New Year's party favors add an extra element of celebration to ring in the new year in style. From simple to fancy, these party favors should be both fun and festive. These items are widely available at any party supply store, and come in a wide variety of styles and colors. You can choose silly hats and noisy horns for a casual party, or fancy champagne flutes for a more formal gathering. You can put a twist on the usual New Year's party favors by adding your own personal touches, or go for something completely new and different. Purchase or make your own wine glass charms to add to champagne flutes, and let your guests take them home. Add a small bottle of bubbly if you'd like. For a small gathering, you can have champagne glasses engraved with a special message or the guests' names and the new year on them. Make your own confetti by recycling used wrapping paper and tissue paper from Christmas presents. Shiny and colorful paper makes the best confetti, and this is a project that you can get the kids involved in, too. For less clean-up, go outside at midnight to throw the confetti. Create your own fortune cookies. There are numerous recipes for fortune cookies available online like this one from Taste of Home. Write up personalized or humorous fortunes with predictions for the coming year to place inside, and wrap each one with colored cellophane and ribbon. Pillar candles, soap, and other everyday items can be engraved or stamped with a new year's message. You can do this yourself if you have the knack, or order engraved candles online from an Etsy merchant. Disposable cameras allow guests to capture their own memories from the party. Have guests write their names on the cameras, and provide a drop-off box for depositing them after they've been used. Have the film developed with doubles and give each guest copies of their own photos. This way you'll also get a complete set of pictures too. 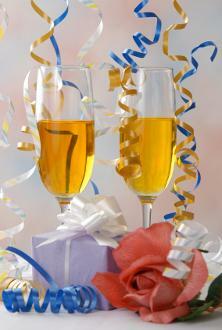 If you plan to have children at your New Year's party, you'll want to pick up some special party favors just for them. Try some of these suggestions. Grab bags filled with things like balloons to inflate, small puzzles, wrapped candy, glow bracelets or necklaces, silly hats, noise makers, and other party supplies will keep kids busy. A small and simple project like decorating cupcakes or stringing beads acts as both entertainment during the party and a party favor to take home. For edibles like cupcakes or cookies, provide small boxes for easy, mess-free transportation. Party crackers can be a fun way to decorate a kids' table and give them something to take home. These paper crackers pop when you pull them apart, and inside are paper hats and small toys, along with jokes and riddles. Small clocks or stopwatches make fun party favors for kids, and they can use them to count down the minutes and seconds until the new year begins - if they can stay awake that late! No matter what kind of party favors you decide to provide for your guests, the emphasis of a New Year's party is on celebrating the past year and ringing in the new one together. Simple gifts and favors will be appreciated by all who attend.